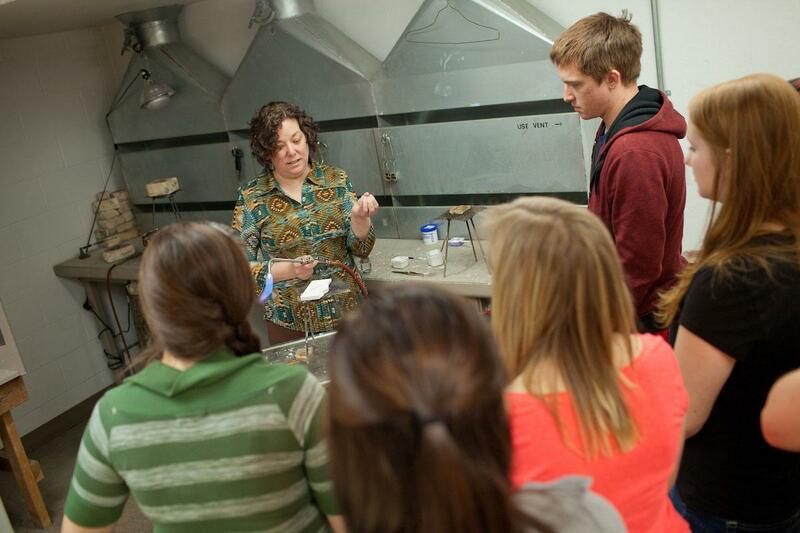 UNC Galleries' educational mission offers numerous opportunities for college students, faculty, K-12 teachers, and the community to enjoy our exhibiitons. We activate each of our exhibitions with programs such as: artist talks, interdiscliplinary panels, gallery receptions, and hands-on workshops. All of our public programs are free to UNC students and the public. 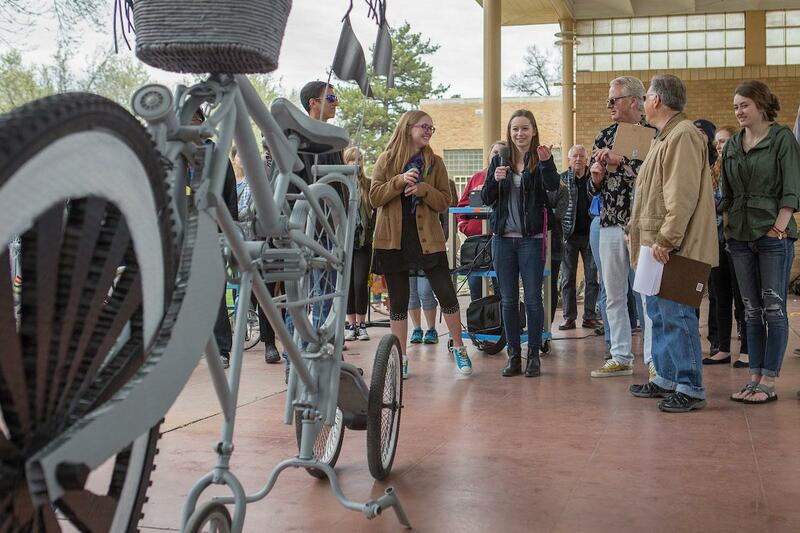 The Visiting Artist (VA) Program welcomes experts from around the country to Greeley for one-day campus visits or week-long "micro-residencies." The VA Program offers unique opportunities for firsthand discussion with artists, curators, and scholars to provide a closer look at how creative professionals live and work. 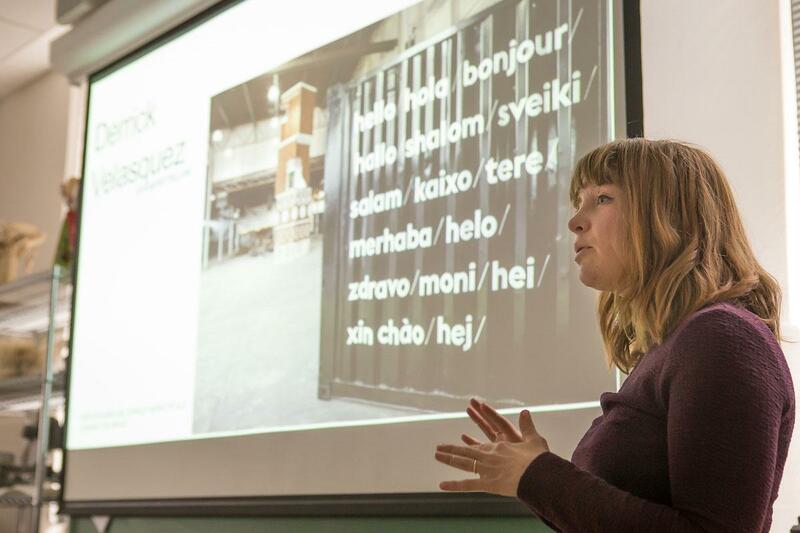 Visitors present their practice in a public lecture and are integrated into the curriculum through targeted, intentional classroom visits, individual student critiques, and collaborative workshops. All exhibitions and public programs are FREE and open to the public! UNC Galleries is proud to welcome artist and UNC Alumna, Jessica Forrestal back to campus as the inaugural Artist-In-Residence at the new Campus Commons Gallery. Forrestal will occupy the newly constructed, state of the art gallery facilities located in Campus Commons from mid-December through early February. During her residency, guests are encouraged to stop by the gallery to directly engage with the artist and watch the work unfold, invade, and sprawl across our new gallery walls! To learn more about Jessica Forrestal, visit her website. Drop by the gallery to visit with current Artist-In-Residence, Jessica Forrestal as she works on her latest installation, ConStructs and ConFines. Visitors are welcome to engage with the artist and ask her questions about her work, or simply sit back and observe as she draws directly on the gallery walls and floors! Drop by the gallery to visit with current Artist-In-Residence, Jessica Forrestal as she works on her latest installation,ConStructs and ConFines. Visitors are welcome to engage with the artist and ask her questions about her work, or simply sit back and observe as she draws directly on the gallery walls and floors! Interested in applying to the 3rd Annual Art History Symposium? This information session will help interested students learn more about the submission process, important dates/deadlines, how to prepare your papers for submission, and Q&A. Every Wednesday, join us for LIVE music in the Galleries! Special thanks to the UNC School of Music's Jazz Studies Program. Bring a lunch/bite to eat and join us in the Gallery! This recurring event is FREE and open to the public. "Crafting Your Narrative & Social Media Marketing" 2-hour event! Join us for a two-hour workshop with Julia Rymer and Jessica Loving-Campos of Artboss! This professional practice workshop will begin with an exercise for all creatives to dive into crafting their narratives. Artboss will target commonly asked questions such as: Who are you? What do you create? What is special, different and unique about your work? These simple questions feel complex, but Artboss will help flesh out who you are as a creative, putting participants in a position to stand out from the crowd. The second half of the workshop will focus on how to incorporate that narrative into social media marketing strategy, branding your practice, developing your portfolio, etc. Participation is FREE, but let us know you plan to attend! RSVP here! Awaken your inner installation artist! Learn how to professionally handle, hang and store your artwork with Graham Thompson. Trained in the art of shape and color, Graham has been living and working on the Front Range since graduating from Colorado College in 2012. As a professional installation artist, she has assisted artists and museums with major exhibitions and large-scale installations, including the Boulder Museum of Contemporary Art, The Museum of Contemporary Art in Denver, and Redline Contemporary Art Center. This two-hour workshop gives you the tools and tricks of the trade you will need to hang your own show! Please join us in celebration of this year's Southard Award Winner from the School of Art & Design, Julia Bannerot. 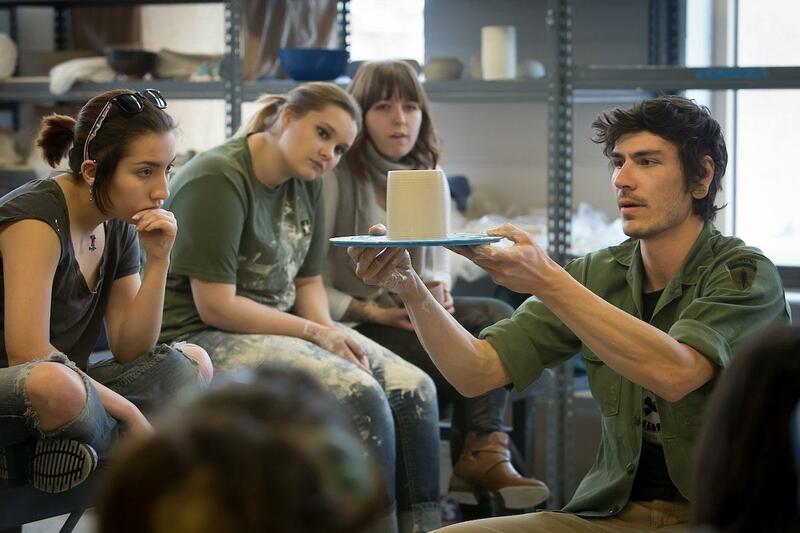 The Southard Award is the School of Art and Design’s most prestigious competition. Students submit a written proposal selected for a public presentation of creative work. The objective for the competitive process is provide students with an opportunity to develop the materials, documentation and conceptual sophistication, needed in order to pursue advanced academic or professional opportunities upon graduation from UNC. Learn more about the Artist Help Desk here! It's time to celebrate! Join us for the opening reception for, The Working Artist. The exhibition asks the question, "What will artists create when given miscellaneous materials and an open gallery space?" McKague and Webster highlight the art of creating but creating an exhibition that encourages collaboration between artists and aims to shed a light on the process behind the creation of artworks. With heavy focus on documentation and process, this installation/performance challenges the idea that art is only the final product. Interested in participating in this exhibition? Sign up for a 2 hour slot to use objects in the gallery to create your own work of art to have on view! Email: workingartistproject@gmail.com for more information! It's time to celebrate! Join us for the opening of Jessica Forrestal's site-specific, hand-drawn installation: ConStructs and ConFines. This is the first exhibition in UNC Galleries' new facilities in Campus Commons. Please join us as we celebrate the work of our featured artist and our new exhibition venue! This event is FREE and open to the public. Food, drink, and music provided! Check out our Facebook Invite! A Valentine's Day Professional Practice Workshop + Mocktail Hour to Immediately Follow! Just in time for Valentine's Day, this professional practice workshop riffs off of speed dating; An organized social activity in which people have a series of short conversations with guests sharing similar interests. Participants are encouraged to bring copies of their professional documents (artist statements, resumes, etc.) for 15-minute one-on-one engagements with creative professionals from around the region. At the sound of the bell, guests advance to the next reviewer, providing individuals with multiple points of feedback throughout the event. Mingle and practice your "elevator pitch" at our mocktail mixer immediately following speed dating rounds! Participants are encourgaed to bring your business cards to share. This event is FREE and open the public! Join us for the closing celebration of The Working Artist, an exhibiton that asks the question, "What will artists create when given miscellaneous materials and an open gallery space?" Step into Mariani Gallery and experience the collaborative work created by students, faculty, staff, and the public during the duration of the exhibition. Led by featured artist, Jessica Forrestal this workshop focuses on the concepts of drawing as collage, and pen and ink techniques. Participants will work on their own individual drawings during the first half of the workshop. The second half of this event will focus on enlarging drawings for the experience of painting a mural. Attendees will leave with a better understanding of the scope of planning for large-scale installations, mural preparation, and "tips and tricks" for maintaining a steady hand and line quality during execution. Join the celebration! Fahrenbruch's work calls attention to the little hidden worlds of beauty that exist all around us. These microcosms can be found in something as mundane as a cluster of ripe berries, colorful lichen growing on a boulder, or the rhythmically chaotic angles of cactus spines. Corianne Wells & Kristopher Wright are artists, curators, and co-founders of Odessa, a nomadic arts incubator expanding the definition of what art is—and where art can happen. The duo has worked with emerging visual artists on forward-thinking art exhibitions, critical discourse, and community engagement. Using storytelling to help artist communicate their value to new audience members all while making the process more transparent, more creative and more experimental. UNC Galleries is proud to add that Wells and Wright are the guest jurors for the Spring 2019 Mariani Gallery call for proposals. Wells and Wright reviewed student's submissions and chose three (3) to exhibit in Mariani Gallery throughout the Spring 2019 semester. Bryan Cera is an artist, designer and maker from Milwaukee, Wisconsin whose practice explores the intimate and often dysfunctional relationships between humans and their technologies, while investigating information and data’s reciprocal relationships to matter and ideas. His studio explorations traverse interactive video installation, wearable electronics, kinetics and robotics, and platforms for digital fabrication. He has shown work across the US, including exhibitions in California, Maine, Nevada, Philadelphia, Utah and Wisconsin, and has contributed to international exhibitions in Australia, Canada, China, Great Britain and Switzerland. 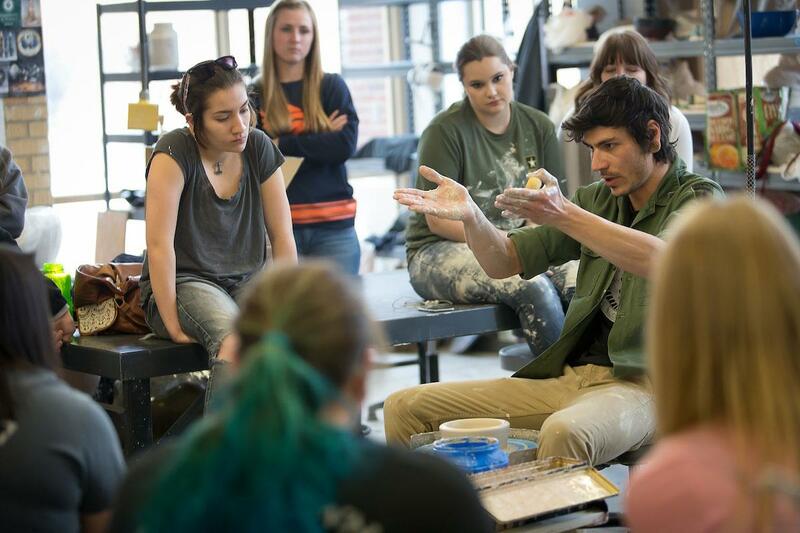 Bryan holds a Bachelor’s in Interdisciplinary Arts, as well as Master of Arts and Master of Fine Arts in Art and Technology from the University of Wisconsin-Milwaukee. In 2016 he founded the Thing Tank - a laboratory dedicated to tinkering, rapid prototyping and research in object design and digital fabrication. He currently serves as Assistant Professor of Object Making and Emergent Technologies at the Alberta College of Art and Design in Calgary, Alberta. Spread the Word! View Printer-Friendly Poster of Events Here! 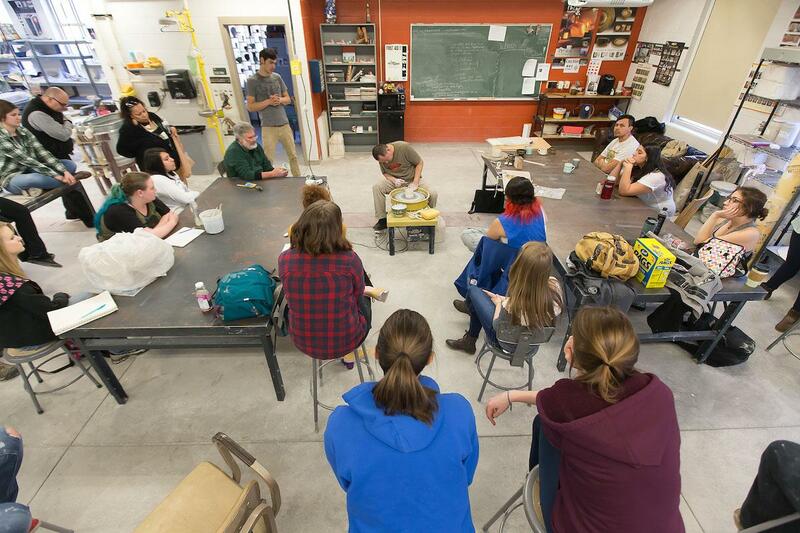 How can the art classroom be a space to discuss controversial issues? As we in the art room encourage new ideas, creative thoughts, and innovative approaches to learning, how do we allow for different opinions? How do we teach students whose beliefs are different than our own? How do we create an environment where dialogue is encouraged? Dr. Hochtritt is a faculty member and director of the Master of Arts in Teaching (MAT) program at the Maryland Institute College of Art in Baltimore and author of Art and Social Justice Education Culture as Commons. She has over 25 years of experience in arts and education. Teaching students of all ages, undergraduate, and graduate courses ranging from history of art education, theory and philosophy of teaching, curriculum theory. A professor of Theatre Arts at UNC for the College of Performing and Visual Arts, Gillian McNally specializes in the connection between the arts, youth, and community. Her extensive experience is particularly with low-income and racially diverse populations. McNally has worked with the national programs like TRIO that helps lowincome and first-generation students with access to college and New Voices that works with urban and suburban high school students. 1:45-2:45pm: Teacher Panel with Wendi Oster, Kate Giese, and YOU! “There are no dangerous thoughts for the simple reason that thinking itself is such a dangerous enterprise…non-thinking is even more dangerous” (Hannah Arendt, Giroux, 2016, p. 14). As the Education Director at the Museum of Contemporary Art Tucson, Eli provides leadership, direction, and coordination for the Museum’s education and public programs. He is currently a PhD student in Art and Visual Culture Education at the University of Arizona. Eli is also an artist and received his MFA in Studio Art from the School of the Art Institute of Chicago where he was a full-tuition Merit Scholarship recipient. In addition to MOCA, he taught at Pima Community College and the University of Arizona. His research and programming focus is the LGBTQIA+ community, access, and public pedagogy. Participation if free but an RSVP is appreciated. Let us know you're coming! Learn more about the Art Help Desk here! The Annual Student Exhibition is an annual juried showcase of the students of the School of Art & Design. This year's exhibition will be held in Campus Commons Gallery, located within Campus Commons- A student centered building that contains a new performance and gallery space for our Performing and Visual Arts programs. A professor emerita of art education from San Francisco State University and author of Art-Centered Learning Across the Curriculum. Her focus lies in art-centered, inquiry based integrated learning, the uses of contemporary art and visual culture in art education, and the intersection between creativity and learning. Julia is has published in Studies in Art Education, Art Education Journal, International Journal of Art Education, and chapters in national art education anthologies.